How does does a lava lamp work? Can you set your own hand on fire without hurting it? And what happens if you remove the shell of an egg and put it in syrup? 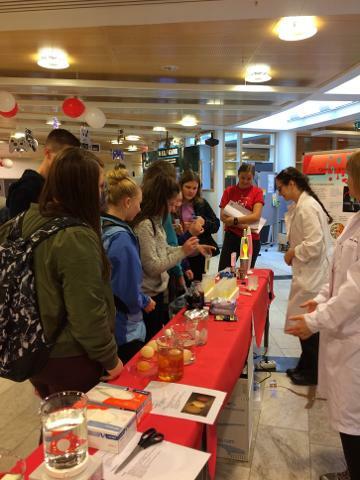 Hundreds of people have visited the Department of Chemistry at the Science Days 2016 on Friday September 30 and Sunday October 2 to watch and perform Chemistry experiments. The theme of this year's Science days was 'Borders' and the location was Campus Tromsø. 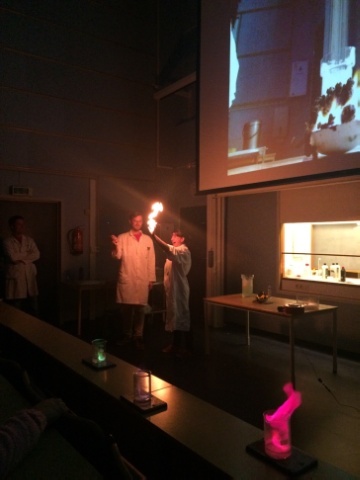 The "smell & pang" Chemistry show attracted full crowds of school children on Friday and three full auditoria on Sunday, so many people that an extra show had to be organised. Among lots of fire and colours, the most awe-inspiring act was the 'hand on fire' (which does not hurt, according to the stuntwoman in the picture below). Meanwhile, the public was invited to perform their own experiments related to 'borders' at the Chemistry stand at 'Forskningstorget'. This proved to be very popular among the schoolchildren on Friday and some even brought their parents to visit the stand again on Sunday. It was also nice to see many colleagues from the Department of Chemistry, with or without partner or children. At the stand, eggs and iodine-starch complexes were used to explain the functioning of semi-permeable membranes (semi-permeable 'borders'), while the border between water and oil was used to make a lava lamp. Fancy mini-lava lamps now decorate many homes in Tromsø. The enthousiastic team, colourful posters, good explanations of the experiments and the strong link with the this year's theme 'borders' led to a nomination for the best stand at the 'Forskningstorget'. The stand of the Department of Arctic and Marine Biology was in the end chosen as the winner amoung the four nominated stands. The following people at the Department of Chemistry have contributed to the (preperation of the) Science Days 2016: Marie-Josée Haglund Halsør, Adele Williamson, Bjarte Aarmo Lund, Tor Olav Berg, Miriam Grgic, Susann Skagseth, Concetta De Santi, Amudha Maharajan, Jørn Hansen and Maarten Beerepoot. The team was led by Yvonne Piotrowski. See this PDF for the protocol of the iodine-starch and the eggshell experiments (in Norwegian). Researching the World's Toughest Bacteria-"Conan the Bacterium"